A trip to Hawaii is always special. But traveling with United Vacations® makes it unforgettable. Stay at some of the most luxurious resorts, book breathtaking adventures and take up to $350 off the whole package when you book by November 8 with promo code ISLAND350.1 Want to see multiple islands? No problem. You’ll still save up to $350 with promo code ISLAND350MS.2 It’s time to start packing for true Hawaii happiness. Queen Kapiolani Hotel is located one block to the beach and near the Honolulu Zoo, Kapiolani Park and Waikiki Aquarium. Built in 1901, this hotel was the first property constructed on the world-famous Waikiki Beach. A picture-perfect tropical escape surrounded by mountains and glittering seas providing pure relaxation. Designed to provide a relaxing haven replete with culturally inspired programs and authentic Hawaiian experiences. This upscale condominium retreat blends the inspiring beauty of the tropics with polished, modern amenities. Spectacular oceanfront location and an impressive selection of amenities. Located on the western shore of Oahu about 17 miles from the Honolulu International Airport in Hawaii. Playful, uninhibited, inspired. That's the essence of what you'll find at Waikiki Beachcomber by Outrigger. Inviting hospitality, timeless Hawaiian traditions, and the spirit of the sea define the Outrigger Reef Waikiki Beach Resort. From the open-air lobby to spacious condominium-style accommodations, guests enjoy the breezy spirit of the tropics. Directly across from the white sand beaches of Waikiki Beach, one of the world's most famous beaches. Experience the idyllic splendor of Hawaii just steps away from one of the world’s most famous beaches. Welcomes visitors to an exclusive Maui destination, where luxury and sophistication meet personalized services and style. Impeccable gardens, golden sands and enchanting all-suite accommodations provide the perfect setting for a well-deserved tropical getaway. Located on 40 spectacular oceanfront acres on famed Kaanapali Beach, this award winning resort offers unlimited activities and amenities. Fronting a world- famous beach, this Hawaiian resort provides families and honeymooners with a charming setting to create lifelong vacation memories. Reminds guests why they chose the Garden Isle for their adventure or getaway. The resort is in a great central location, close to sightseeing, shopping, dining and golf at the Wailua course or Kauai Lagoons course. Nestled on the Coconut Coast, this plantation-style hotel boasts gracious accommodations ideal for families, seniors and honeymooners. This premiere resort offers a world of invigorating lava rock showers, sparkling pools and manicured gardens in a welcoming open-air setting. The hotel fronts the white sands of Hapuna Beach, rated one of the best beaches in America. 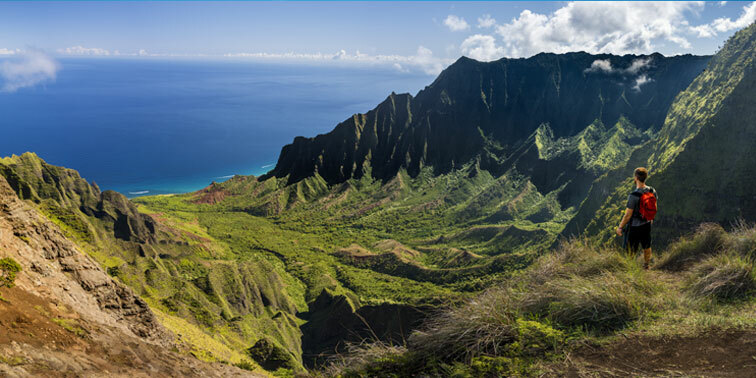 Where sophisticated comfort and Mediterranean flavor blend seamlessly with the natural wonders of Hawaii. Situated on the sunny Kona Coast, this breezy family-friendly resort offers spacious, comfortable suites amidst meticulously landscaped grounds. 1Promo code ISLAND350 is valid for travel 10/26/18 - 7/31/19 for air/hotel and hotel only packages to Hawaii/South Pacific, 2-night minimum stay required. Save up to $350 per reservation based on a 6% discount on the hotel portion of the vacation. Valid on new bookings made between 6 pm CST on 10/25/18 and 6 pm CST on 11/8/18. Must enter promo code ISLAND350 at time of booking. 2Promo code ISLAND350MS is valid for travel 10/26/18 - 7/31/19 for multi-stop air/hotel packages to Hawaii/South Pacific, 4-night minimum stay required. Save up to $350 per reservation based on a 2% discount on the hotel portion of the vacation. Valid on new bookings made between 6 pm CST on 10/25/18 and 6 pm CST on 11/8/18. Must enter promo code ISLAND350MS at time of booking.